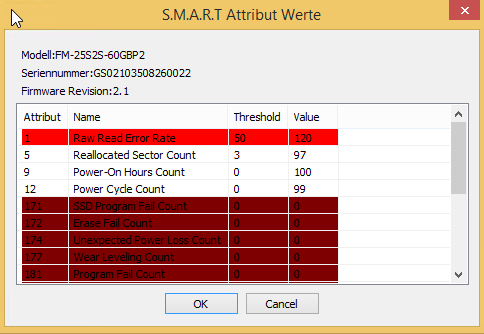 This Software implements support for S.M.A.R.T capable Hardware. This is very useful to detect problematic components before they actually fail. Host and Cache Devices are getting monitored continuously. The User will receive warnings when trying to add a cache with problematic hardware. The hardware gets monitored in a 1 hour intervall and will notify the user If the predicitve analysis is positve. Yellow: S.M.A.R.T: is not active / available. Orange: Highered Values for uncritical Attributes. Red: Highered Values for critical Attributes. Dark Red: Threshold exceeds Condition ( T.E.C) has already happened with at least 1 Attribute. TEC is an estimate actually built in by the Manufacturer of the storage device. It is a failure date, although the device might not fail at all or even earlier. It is advised to not use SSDÂ´s that are in such a bad shape like the one in the picture above. A typical phenomenon is that such a device will suprisingly stop Operating. Leaving the Host Computer in a waiting state. This is also called âSSD Freezeâ or âhangâ. There are a number of new S.M.A.R.T. User Configurable Options in the applications âSettingsâ Pane. By default every warning is on , but you can turn them off there.